This one goes out to all the poor babies who will be born this coming Friday…February 29. Which is by all known standards and belief systems considered the absolute worst day in the history of time to be born on. Having only three actual birthdays by the age of twelve is the kind of thing that will warp a kid to the point of unscrupulous derangement followed by a 24 hour period of magical normalcy that reoccurs once every four years. It is a scientifically proven fact that infants born on Feb. 29 are 13.54% more likely to have additional limbs, misplaced clavicles, and be abducted by aliens. In very rare cases, “leaplings” develop super human powers such as radioactive fingernails and the ability to spontaneously generate piles of tin measuring cups out of thin air. Though these powers would prove very useful to the human race…and housewives, is it really worth the risk? 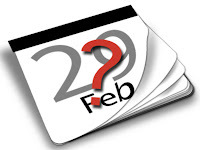 So for all you leaplings out there, I wish you a joyous and enchanted February 29…my hope and dream is that each and every one of you enjoy your birthday this Friday as if it wasn’t going to happen for another four years…because it isn’t.